Children may require a space maintainer if they lose or have baby teeth removed before the adult tooth is ready to erupt into the mouth. Baby teeth play a very important role in the development of the teeth, bite and facial muscles. They help guide the adult teeth into the correct position when the baby teeth are lost. 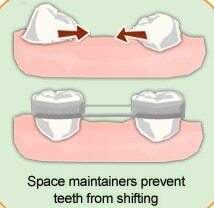 The purpose of a space maintainer is to allow enough space for the adult tooth to erupt into its normal position in the event that a baby tooth has been lost early. 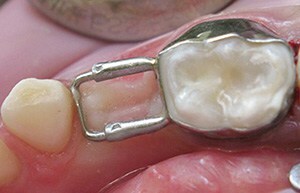 A space maintainer can either be made of metal or acrylic and there are a number of designs depending on the number of primary teeth lost and the position of the tooth in the mouth. If a baby tooth is lost early and the space is not maintained, the neighbouring teeth can shift into the open space and braces may be required. Not every child who loses a baby tooth early requires a space maintainer, however, a consultation with your orthodontist should be conducted to determine if using space maintainer is needed.